In this SOLARAY PRO ZX-1 Professional Series Flashlight review you will see how this particular flashlight is a huge upgrade for anyone that still uses the old ordinary flashlight. Tactical flashlights are the “in thing” for 2016, more and more people are interested in upgrading their old flashlights to tactical flashlights which have more benefits. 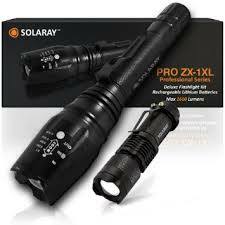 One of the best tactical flashlights on the market is the SOLARAY PRO ZX-1 Military Grade LED Flashlight. This particular flashlight is made tough and will cut through the darkness with a super bright beam. It is a little more pricey than traditional flashlights but you won’t be unhappy with your purchase. On Amazon.com the SOLARAY PRO ZX-1 has over 1,300 customer reviews and has a rating of 4.4 out of 5 stars. Customers like its durability, superb brightness, 5 mode features, and longevity on 1 charge. Click here for the best SOLARAY PRO ZX-1 prices online. Ultra-bright LED: This flashlight provides a maximum of 1200 lumens powered by the ultra-bright CREE XM-L T6 LED chip technology. It also has zooming capabilities which is standard to use on most flashlights by turning the bezel. 5 Mode Light Selection: There are 5 light modes that you can select from depending on how bright you want your light: High, Medium, Low, Strobe, and SOS. To activate any of these features only requires a touch of a button on the flashlight. Flashlight Construction: The flashlight is made of durable aircraft grade aluminum that is corrosion free. The durability of the flashlight makes it impact resistant for hard falls or drops to the ground. It is also water resistant and the aluminum materials used to construct the body of the flashlight are hardened anodized finish. Dual Battery System: Flashlight offers a dual battery system that allows the user to use AAA size batteries or 2 disposable 2400mAh Lithium-ion rechargeable batteries. It comes with the lithium batteries. Specs: weighs .31 pounds and is a little over 6 inches long. Water resistant in less than 1 meter deep water.